When setting up custom fields in Class Charts, you may wish to ensure that certain custom fields are applied to all classes. To set custom fields as default, click on the three lines menu in the top right hand corner of the page and select Custom fields from the list of available options. Front: Tick this checkbox to include the field on the front of pupil cards in class. Flip: Tick this checkbox to include the field on the back of pupil cards in class. Background: Tick this checkbox to include the field as a highlighted background for pupil cards in class. When custom fields are ticked, a preview of their position on a typical pupil card can be seen to the right of the custom fields list. 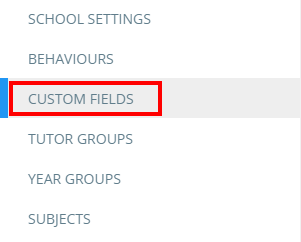 If your school's custom field list is quite long, you may wish to only see fields that have been selected. To filter the list by selected custom fields, tick one of the three check boxes that appear above the list. The custom fields list will now be filtered by the chosen check box.